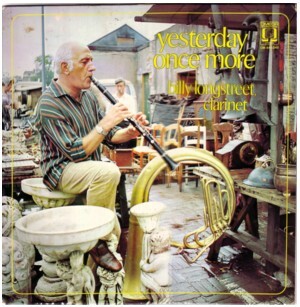 As I wrote here and there I have a deep interest in the Dutch musician/composer/bandleader Willy Langestraat, who made some exotic records under the name Laguestra in the 50’s and 60’s. I would love to see a CD with his best work released somewhere, but so far it seems unlikely this CD will be available soon. As Laguestra, Willy Langestraat did not made many records: about ten official 45’s, one 10 inch LP and a few advertisement records. The most interesting part of his oeuvre consists of radio concerts and never released demo’s. But I try to collect all music I can find of the man, of course. Recently I got hold of two records I had never seen before: a advertisement record for a company named Capri, and an late 70’s LP with ballads, recorded under his real name. 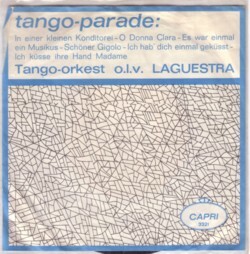 Unfortunately both records are not very interesting for an objective listener: the Capri single has two tango medley’s on it, and the LP is a collection of ballads, with Willy Langestraat playing clarinet. I prefer him playing sitar or Indian flutes! But it is always nice to find unknown records of my heroes, and it is also a good excuse to share with you some of his best recordings. Like this song, that Roland Vonk found on a tape with home made demo’s with no further information. It is probably recorded around 1960, and all instruments are played by the man himself.